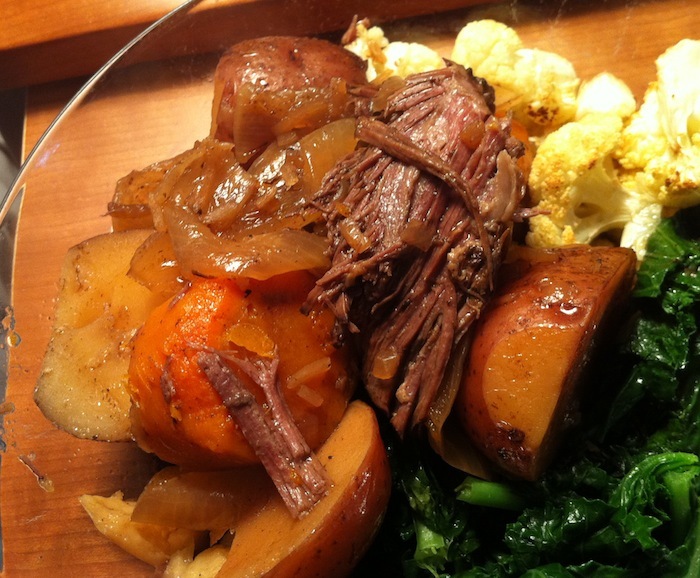 The most important thing about this pot roast is that you don’t have to brown the meat. I wanted something easy that I could throw together in the morning and leave all day, and this is the perfect recipe for that. You wouldn’t believe how many crock-pot pot roast recipes tell you to brown the meat in a separate pan first….doesn’t that defeat the purpose if you have to dirty two pans?! So dear readers, this is for anyone who’s lazy like me, wants to avoid dish-pan hands, or who just wants an absolutely fantastic pot roast. Mom even said this was the best pot roast she’s ever had! High praise from a lady who knows how to cook some roasts! I got all traditional and made this for a Sunday dinner, but I think this would be an absolutely fantastic dish to make for company (assuming they eat meat of course). Nothing better than having your main dish cooking away all day, leaving you free to clean house, make sides/desserts, or do whatever you want until your guests arrive. This dish does call for a bit of orange zest. I was skeptical, but it does add a nice fresh note to the meal, and isn’t overwhelming. I’d recommend trying it with the zest, but I’m sure this dish would still be fantastic if you leave it out. In a large slow cooker, add roast, potatoes, carrots, onion and celery. Add remaining ingredients. Cook on low for 5-7 hours. Roast and veggies will be fork tender (and utterly delicious). I love the meal here- sounds easy yet delicious! Haha am I starting to change your mind about not liking pot roast? ?